My homemade vanilla coffee creamer post has been so popular that I thought I would try to create a pumpkin spice coffee creamer for the fall. I’ve tried making homemade pumpkin lattes in the last few years, but each recipe that I sampled left me with a big glob of squash down in the bottom of the cup, which just ruined the whole thing for me. So I set out this week to figure out a way to get the pumpkin flavor into my coffee creamer without all the pulp at the bottom. My first thought on obtaining pumpkin flavor without actually having to use pumpkin pulp was to start out with a pumpkin syrup. So I headed down to my local grocery store, only to find out that they carry only caramel, vanilla and hazelnut syrups. I thought about ordering some, or driving to a few other stores to see if I could find it, but that would sort of go against my aim to create a frugal and homemade creamer. Next, I considered baking a pumpkin and using the liquid from the pan to add pumpkin flavor to my coffee. But it seemed like too much work for the quick creamer recipe I wanted, plus I didn’t know how much pumpkin flavor it would give me. In the end, I decided to cook some canned pumpkin puree with some milk and pumpkin pie spice, then add it to the sweetened condensed milk, as I did in the homemade vanilla coffee creamer recipe. Turns out, that did the trick! 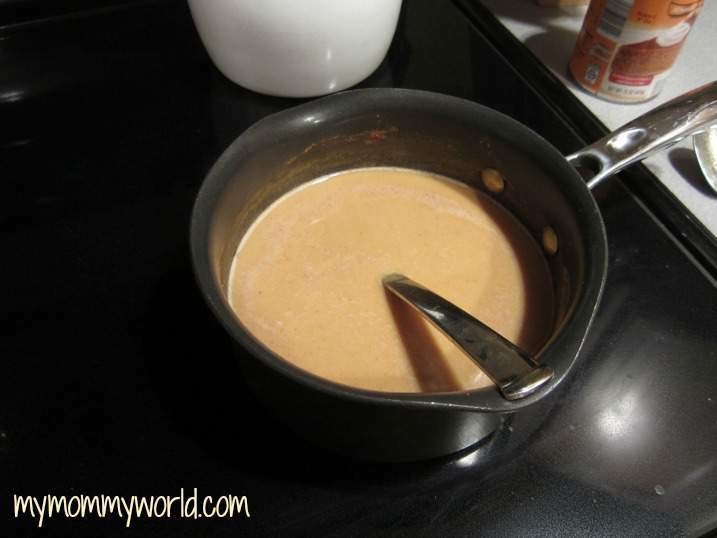 Using the same proportion of ingredients from my vanilla creamer recipe, I added the milk to a small saucepan with half a can of pumpkin puree and 1/2 teaspoon of pumpkin pie spice. Stirring well, I let it cook until the milk started to scald. (You don’t want to let it boil) This step took only about 5 minutes or so. Next, I poured the milk and pumpkin mixture into a strainer and pressed it through with a spoon. This helps get rid of all the extra pulp that usually collects in the bottom of the cup. Some of the pulp will come out of the bottom of the strainer…you want to make sure to scrape that off and mix it into your milk. These bits of pumpkin are fine enough that they will mix well with the milk and won’t settle at the bottom of your cup. Discard the pulp inside the strainer, and add your condensed milk into the pumpkin milk and stir well. 1. 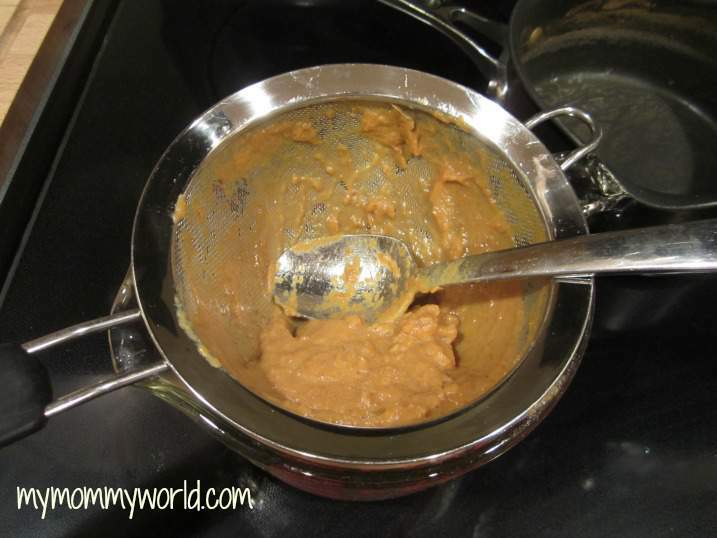 Cook milk with pumpkin puree and pumpkin pie spice over medium heat for about 5 minutes, until milk begins to scald. Do not let the milk boil. 2. Pour milk mixture into a strainer, pushing the pulp through with a spoon. 3. 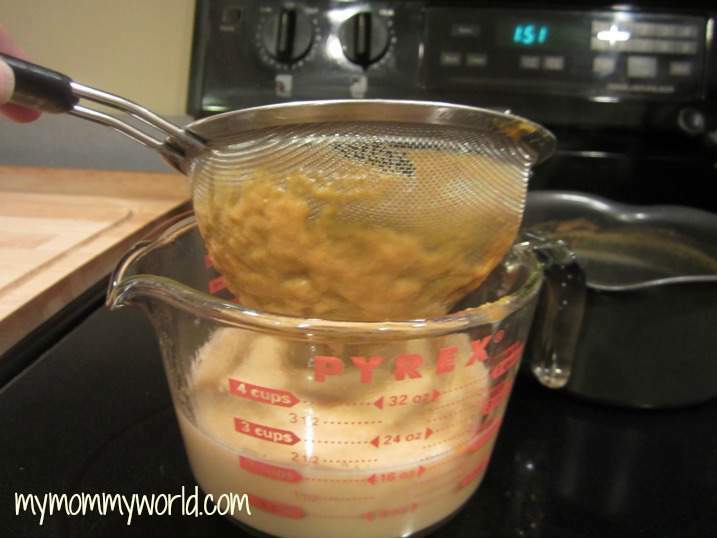 Be sure to scrape the fine bits of pumpkin pulp off the bottom of the strainer and stir it into the milk. 4. Add the can of condensed milk to the pumpkin/milk mixture and stir well. 5. Pour into a sealed container and refrigerate. 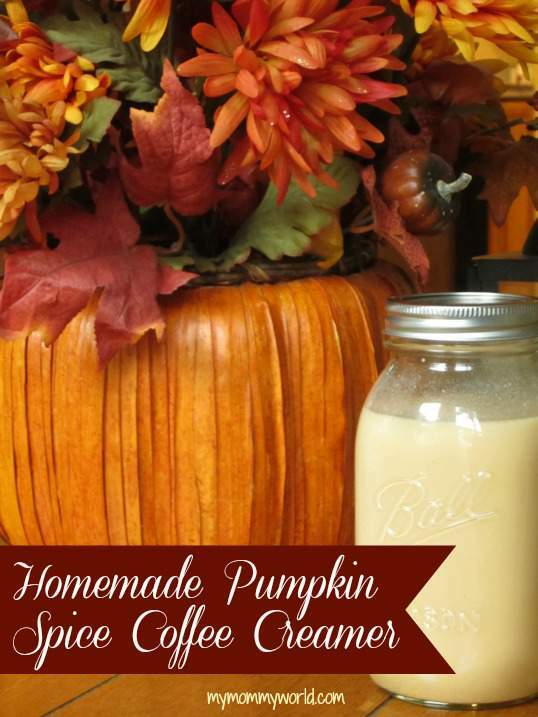 I hope you enjoy your own homemade pumpkin spice coffee creamer! Glad to see you found a way to get the pumpkin flavor without the pumpkin purée in the bottom of the cup. Thanks for sharing your recipe. I might give making a dairy free version for my family a try. We don’t drink coffee but it might be nice to make pumpkin spice steamers. What a lovely recipe! I will get started on it right away! It seems to be the perfect recipe for the fall season! Thank you so much! This sounds wonderful! I have a weakness for all things pumpkin! How long will this stay fresh? Hi Laura! Thanks so much for stopping by! You know, whenever I made coffee creamer, it never lasts longer than a few days…we drink that much coffee! So I would say maybe a week at the most, if you make sure to keep it refrigerated.